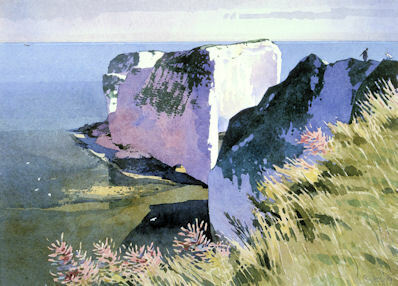 Old Harry Rock lies off a headland between Studland and Swanage in Dorset. Here we see it late on a warm summer afternoon. From the angle of the sun we can tell that is is time for tea, or perhpas something stronger, in Studlands village inn, which fortuantely for walkers and artists is not too far away.